.cur 파일을 만드는 방법이 있다. 하지만 번거롭다 그냥 이미지를 커서로 만드는 방법은 아래와 같다. To generate a PDF from a HTML file with C# in Windows Forms, we are going to use Pechkin, the .NET Wrapper for wkhtmltopdf DLL, library that uses Webkit engine to convert HTML pages to PDF. 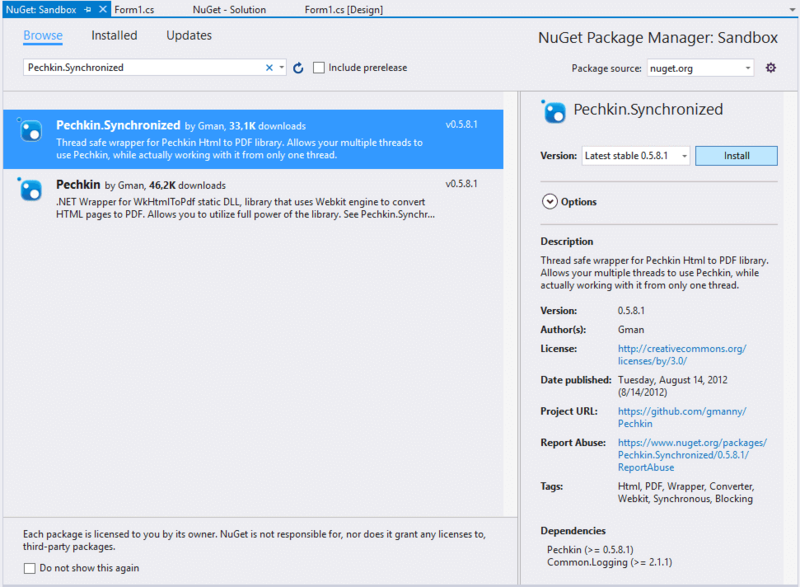 Pechkin is available as a NuGet package, in most cases you should use SynchronizedPechkin as it protects multithreaded code from crashing the lib. But for simple usage from one thread, you can use SimplePechkin directly. Pechkin includes the latest version of wkhtmltox DLL in the project (and in NuGet package) along with its dependencies, and copied into build folder on project build. So there's no need to install any prerequisites before using the library on the computer. 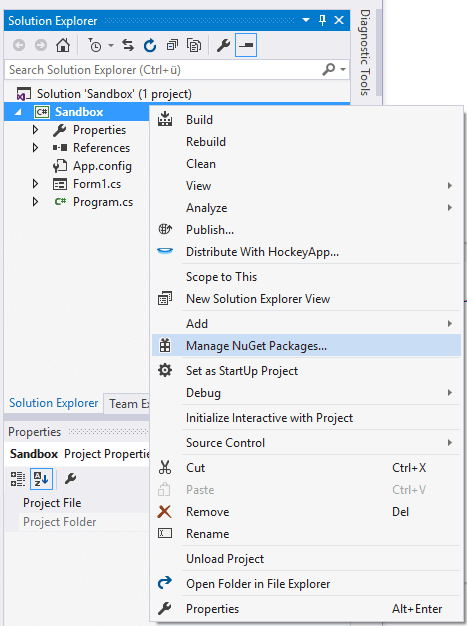 Once the setup finishes, you will be able to use the wrapper in your project. The Convert method converts a HTML string (or a configuration object) to PDF with the given settings and returns a byte arrays that store the binary data of the PDF. With all the examples, the pdfContent variable will generate only the content of the PDF and you won't see anything, therefore don't forget to write the created content into a file by following the step #3. // a new instance of Margins with 1-inch margins. Now that you know how to generate the content of a PDF, you only need to learn how to save it. // Writes a block of bytes to this stream using data from  a byte array. 결론을 요약하면 (직접 좀 많이 구현을 해야 하지만...) ZeroMQ가 제일 성능이 좋지만 RabbitMQ도 괜찮다. ◦ZeroMQ broker outperforms all others. This means that unless you have a need for complex broker features, ZeroMQ is a perfect message dispatcher among processes. ◦Except for big messages, RabbitMQ seems to be the best bet as it outperforms others by a factor of 3. /// Array 내용을 랜덤하게 뽑아오되 앞에서 뽑힌내용은 제외하고 뽑아올때 사용됩니다. // Make sure this is an xps file. // Get the file's name without the .xps on the end. // Load the XPS document. // Get a fixed paginator for the document. // Process the document's pages. // Render the page into the memory stream. // Save the PNG file. 프린터에서 인쇄 이벤트가 발생될 경우 이벤트를 받아서 처리하는 코드..
이벤트에서 ManagementBaseObject 값을 출력해 보면 아래와 같다. 컴퓨터에 설치된 프린터 목록의 이름만 가져오는 코드입니다. foreach 를 이용하여 PrintQueue 의 항목에서 설치된 프린터 정보들을 가져올 수 있습니다. 헌데 복잡한 문자열은 Class 화 하기가 머리아픈데 아래 사이트가면 간단하게 만들수 있다. 변환하면 RootObject Class 가 가장 상위단의 Class 이며 RootObject 로 DeserializeObject 하면 된다.